WHAT IS IT? Well this was a tough one. I was really wondering what I should do for this challenge. I refuse to paint ghosts or the like on my nails. And there were the new A England polishes waiting for me. So what should I do? It was just so easy: The green one is named “dragon” and this should be supernatural enough, don’t you think? To try out some more things from my nail order I added some glitter to imitate scales. And now look, that’s a Common Wesh Green, don’t you think? Well, it was really hard to get a picture that approximately showed it right. This is the best I managed and yet it still only gives a hint on how the glitter actually looks on my nails. WHAT IS USED? 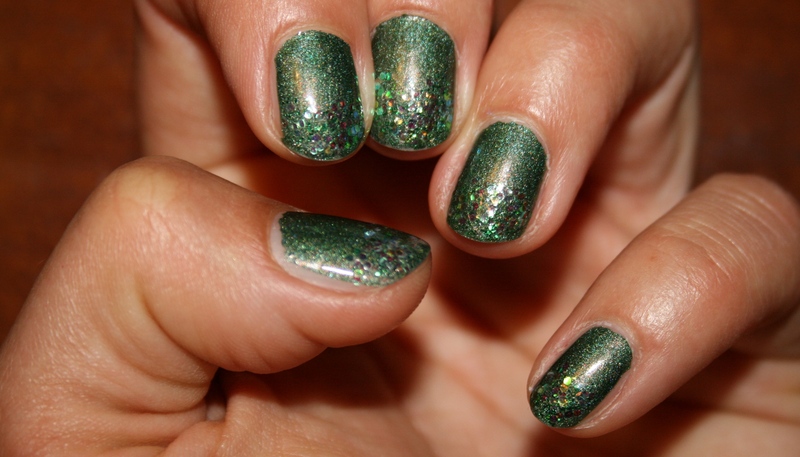 Well my first A England nail polish “Dragon” which is a near holographic mossy green and already super cool on its own. It dries in a normal speed and is nearly opaque in one layer but to see how it behaves I added another one. To add scales I used another LA Splash Nail Art Glitter in ” ” which shimmers somewhere between golden green and turquoise and put a little bit of it on the finger tips. As with all the glitter I then added a top coat. HOW DOES IT FEEL? Yes, even though it scares me that I really start to sound like a barbie with my new found love for glitter but I adore it. It is super cool, amazing… honestly, I really like it. In fact I liked it so much, that I changed it from being on Day 29 to Day 28 so I only have to do the Day 28 nails a day later and can keep this mani a day longer on my nails. This entry was posted in Nail Art and tagged 31 day nail challenge, A England, Dragon, glitter, LA Splash, Nailpolish by kathatravelling. Bookmark the permalink.